Fifteen-year-old Parvana, living in post-Taliban Afghanistan, is found alone in the remains of a bombed out school. American authorities seize her and treat her as a suspected terrorist. She is questioned, threatened and mistreated. During the ordeal, Parvana remains silent. She provides no information and never raises her voice to defend herself or explain her proximity to the destroyed school. Told from the point of view of Parvana, we begin with her imprisonment and her stoic silence as she deals with the uncertainty of her future as a prisoner. Although she says not a word to her captors, her memories are portrayed in alternating chapters and take the reader on a vivid and emotional journey through the events leading up to the bombing of her beloved school. Parvana, alongside family and friends, takes a leadership role in the battle against powerful forces opposed to Afghani girls’ right to an education. Her story illustrates one girls’ decision to turn her back on her own safety and comfort so she can fight for the good of her people. Parvana’s Promise takes the reader on a journey through determination and courage as Parvana remembers her past and keeps her silence in the face of her fear. 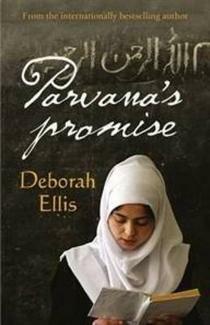 The first two books in this trilogy, Parvana, a young girl’s efforts to make a life for herself in Afghanistan and Parvana's Journey, a quest to find her family, lead us to Parvana’s Promise which continues the story of Parvana’s struggle for survival and rights as a girl living in Afghanistan. Many of Deborah Ellis’s award winning books are based on personal experiences and her own observations of women and children in countries steeped in military and social chaos. Her voice is clear, honest and paints a disturbing but courageous picture that is not often seen outside of these regions. For more information on Deborah Ellis, please visit www.deborahellis.com. Ann Harth is a published children's author and writing tutor at Australian College of Journalism. She loves to read and is committed to creating children's literature that inspires, entertains and triggers a tiny twist in the mind. Her latest middle-grade novel, The Art of Magic, is now available from Amazon and Barnes and Noble.